Shape each half of dough into a roll about 2 inches in diameter; flatten one side so roll becomes a half circle. Roll rounded side in green sugar. Wrap in plastic wrap and refrigerate, flat side down, at least 4 hours but no longer than 24 hours. Heat oven to 375°. Place each roll flat side down; cut into 1/4-inch slices. Place 1 inch apart on ungreased cookie sheet. 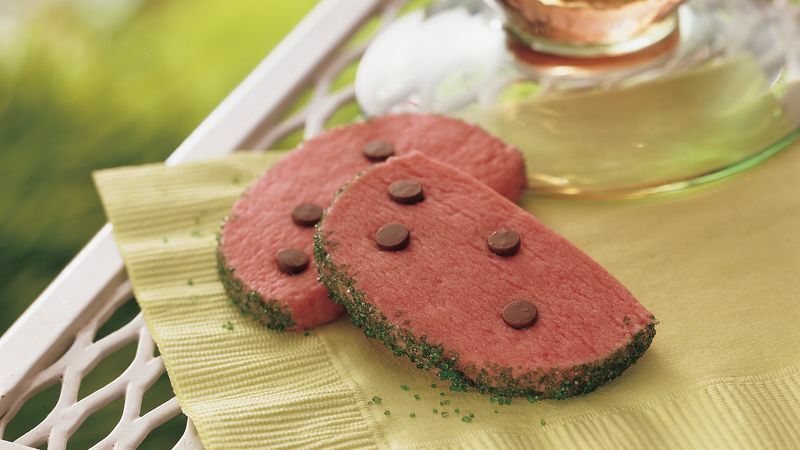 Gently push a few chocolate chips, point sides down, into each slice to look like watermelon seeds. Bake 7 to 9 minutes or until cookies just begin to brown. Immediately remove from cookie sheet to wire rack. Cool completely, about 30 minutes. Paste food color gives a more intense color than liquid food color--even with a smaller amount--and can be used instead of the liquid. Store these cookies in an airtight container. If the chips are soft, refrigerate cookies a few minutes to harden the chips before storing.